In this July 4, 2017 file photo, Ex-Interpol President, Meng Hongwei, walks toward the stage to deliver his opening address at the Interpol World congress in Singapore. China is investigating the former president of Interpol for bribery and other crimes, Beijing said Monday in a notice that indicated the Chinese official may also be in trouble for political transgressions. Meng Hongwei, China's vice minister for public security, was being investigated as a result of his "willfulness" and has only himself to blame, according to a statement posted on a government website. The scant details provided on Monday raised further questions about the scope of the allegations made against Meng and whether they pertain in any way to his work at the international police agency. They also shone an unflattering light on secretive, extralegal detentions in China that have ensnared dissidents and allegedly corrupt or disloyal officials alike at increasing rates under the authoritarian rule of President Xi Jinping. Monday's notice of a high-level meeting of public security officials elaborated on a terse announcement late Sunday by an anti-graft agency of the ruling Communist Party that said Meng was suspected of unspecified crimes. The Sunday announcement was issued barely an hour after Meng's wife made a bold appeal to the world for help from Lyon, France, where she is based. Meng is the latest high-ranking official, and one with an unusually prominent international standing, to fall victim to a sweeping crackdown by the ruling Communist Party on graft and perceived disloyalty. 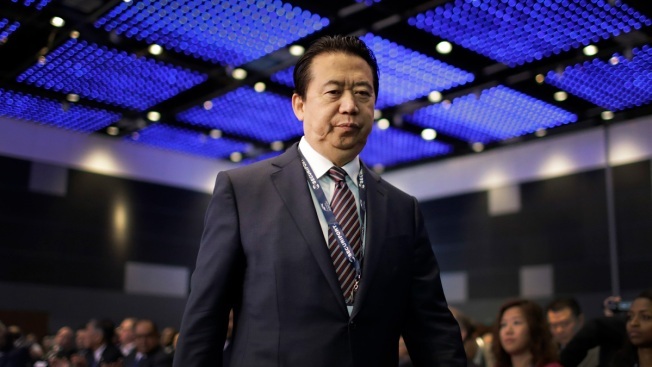 Shortly after China's announcement about the investigation on Sunday, Interpol said Meng had resigned as the international police agency's president. Chinese officials appeared to be scrambling to respond to an unfolding scandal. In the early hours of Monday, Zhao Lezhi, the minister for public security, chaired a meeting attended by senior officials of the ministry's party committee to discuss Meng's case, the statement said. "We should deeply recognize the serious damage that Meng Hongwei's bribe-taking and suspected violations of the law have caused the party and the cause of public security and deeply learn from this lesson," Monday's announcement said. The 64-year-old Meng's unexplained disappearance while on a trip home to China late last month prompted the French government and Interpol to make their concerns known publicly in recent days. The revelation that China's system of shady and often-arbitrary detentions could ensnare even a senior public security official with international stature has cast a shadow over the image Beijing has sought to cultivate as a modern country with the rule of law. The acting president of Interpol, Kim Jong Yang, said it had not been told about the investigation of its chief. "I find it regrettable that the top leader of the organization had to go out this way and that we weren't specifically notified of what was happening in advance," Kim said in a phone interview. "We still don't have sufficient information about what's happening (with Meng) or whether it has anything to do with Chinese domestic politics," he added. Questions about Meng's case dominated a regular briefing by China's foreign ministry on Monday. The spokesman, Lu Kang, rejected the suggestion that China's handling of the Meng probe would hurt the country's image abroad, saying instead that it demonstrated Beijing's commitment to tackling graft. "This has shown the Chinese government's firm resolve to crack down on corruption and crime," Lu said. "It has also made very clear that this case fully demonstrates that the party is firm in fighting corruption and anybody will be punished seriously in accordance with the law if they violated the law." "From now on, I have gone from sorrow and fear to the pursuit of truth, justice and responsibility toward history," she said at a briefing. "For the husband whom I deeply love, for my young children, for the people of my motherland, for all the wives and children, so that their husbands and fathers will no longer disappear." Monday's statement on the ministry of public security's website provided no details about the bribes Meng allegedly took or other crimes he is accused of, but suggested that he was also being investigated for political lapses. It indicated that Meng, a member of the Communist Party, may have somehow been tainted by former security chief and ex-Politburo Standing Committee member Zhou Yongkang, who is now serving a life sentence for corruption. "We should resolutely oppose corruption and resolutely eliminate the pernicious influence of Zhou Yongkang," it said. Meng's various jobs likely put him in close contact with Zhou and other Chinese leaders in the security establishment, a sector long synonymous with corruption, opacity and human rights abuses. Zhou and other senior figures prosecuted in Xi's anti-corruption crackdown were mostly convicted of corruption but officials have since also said they were accused of "conspiring openly to usurp party leadership." At Monday's meeting, officials were told that they "must always maintain the political quality of being absolutely loyal to the party," the statement said. Associated Press writer Tong-hyung Kim contributed to this report.